It’s been a week of learning. My taste buds are clammering for cauliflower soup. It’s in season, so it’s cheap. And the soup is to die for. Today I bought the most luscious looking head of cauliflower. It was snuggled in its bed of deep green leaves. There must be something I can do with these leaves other than compost them, I thought. Having discovered that much nutrition and goodness lies in the stems, leaves and peels of much of our fruit and vegetables, I figured the same would have to hold true for cauliflower (and broccoli) too. And I was right – it does. Pre-heat the oven at 200 °C/400°F . Smash a few cloves of garlic and chop them coarsely. Chop some scallions as well. The whole scallion, not just the white part. (or use already cut up garlic which is 2 cloves per teaspoon.) Note, you can omit the scallions if you don’t want them or don’t have them. This dish tastes the same with or without them. Toss the garlic, onions, and cauliflower with a generous splash of soy sauce and oil in a roasting pan. Sprinkle with salt and pepper. Place the uncovered roasting pan in the oven for about 20 minutes, or until the green leaves are crisp and both the florets and the thicker stalks are tender and can be pierced easily with a fork. (Change the time if you are using a convection oven. If you love cauliflower as much as I do, check out this site for more ideas on what to do with it. 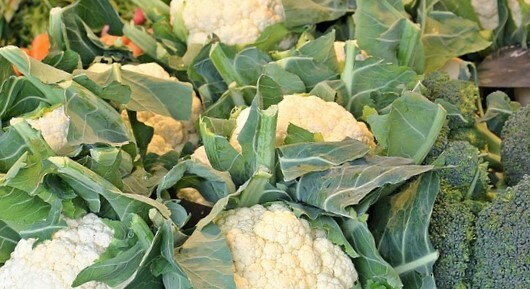 I got to love cauliflower when I lived in Spain it was so white and fresh. I used to eat half of one with my dinner because the potatoes were dire! I know it is good for us but I just never think about doing it. I never throw out leaves or stems. I use them. I like your idea in this post. I’ve never heard of roasted cauliflower leaves. Gotta try it! I eat cauliflower rice all the time. I make hash browns with caulifower rice – so yum ! OMG! I have to try that! Thanks for the suggestion! Ha! I’d never eating considered eating the leaves, but going to give this a try. Sounds delicious! I hadn’t considered eating cauliflower leaves before, but this sounds delicious. One I’ll definitely be trying.